As we had expected, the first half of this year saw the bottom of the tanker market. Our predictions that freight rates for our vessels would rise during the second half of 2018 proved correct. At this time spot contract indexes for two out of five suezmax routes for our one million barrel tankers are above $50,000 per day, compared with the first 9 months of 2018, when the freight indexes showed about $6,000 per day. This is a good illustration of the volatility in freight rates and the potential for earnings in the tanker industry when the tanker market turns. We believe there could be much more to come. We declared $0.01 per share in dividend for the 3rd quarter on November 1, 2018. This is a reflection of the low market and the subsequent low cash flow during the third quarter of 2018. This is our 85th consecutive quarterly dividend distribution, a record unparalleled in the tanker industry. We assure shareholders of our commitment to pay dividends going forward. The time charter equivalent for our vessels during 3Q2018 was $12,000 per day per ship. In 2Q2018 it was $10,500 per day per vessel. Going forward, much higher rates can be expected. During the third quarter we took delivery of two of our three newbuildings, while the third vessel was delivered to us on October 25, 2018. All three vessels were delivered from a top yard in South Korea, on time and on budget. The adjustments to the fleet have reduced the average age of our fleet. 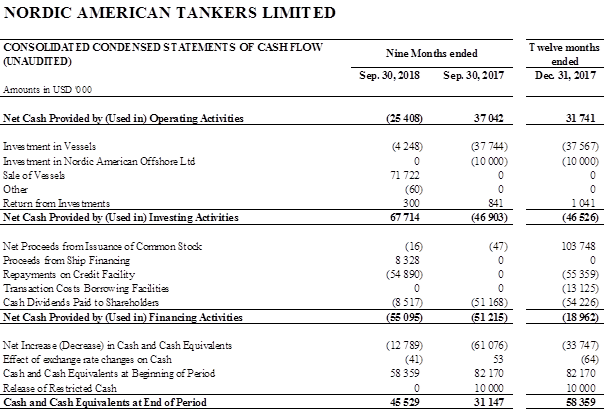 NAT Net Loss for 3Q2018 (after depreciation, G&A and finance charges) came in at -$38M, including a non-recurring charge of $12.7M. Net Loss for 2Q2018 was -$27.2M. NAT Net Operating Loss for 3Q2018 came in at -$15.3M against -$17.5 in 2Q2018. A better reflection of the performance for the quarter, the Adjusted Net Operating Earnings*, came in at $2.1M for 3Q2018, against $0.8M in 2Q 2018. Our Net Debt** at the end of 3Q2018 stood at about $313M for the fleet, equaling about $13.0M per vessel, which is attractive. Our net debt per vessel is among the lowest among publicly traded tanker companies and we will work to secure a financial structure in which NAT has no net debt as was the case earlier. Later in this report we have included financial information for 3Q2018 and for other periods. 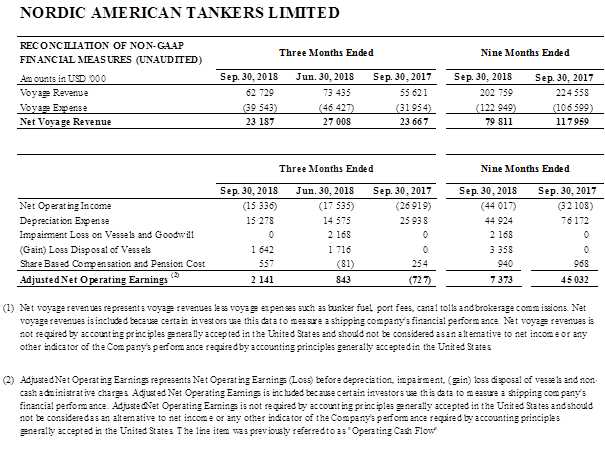 * Adjusted Net Operating Earnings (Loss) represents Net Operating Earnings or Loss before depreciation, impairment, disposal of vessels (gain/loss) and non-cash administrative charges. 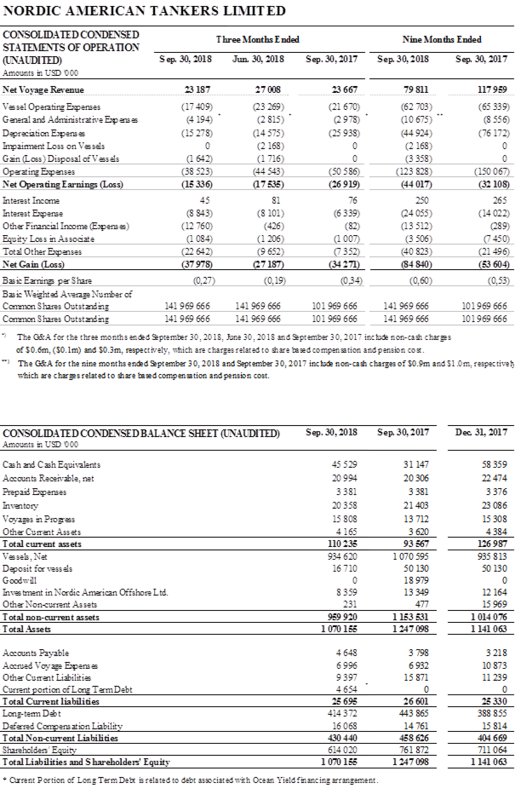 ** Net Debt is long term debt, less net working capital and deposit paid for newbuilding, divided by 24 vessels. We have sold 8 suezmax vessels during the summer of 2018. Two of these vessels were delivered to their new owners at the end 2Q2018 and the remaining 6 were delivered to their respective owners during 3Q2018. The Net Loss from sale of vessels was limited to $-1.6M in 3Q2018. Our fleet at the time of this report consist of 25 vessels. Now NAT has 10 vessels built between 2010 and 2018, 13 vessels built from 2000 through 2009 and 2 vessels built in the late 1990s. The average age of our fleet has come down to about 11 years. The above developments are several of many important steps to renew and grow the NAT fleet in the years to come. In a capital intensive industry like ours, timing and financing are the key issues. The inspections of our ships by oil companies (“vetting”) continue to reflect the excellent quality of our fleet. The Company decided not to pursue a bond offering earlier this year as it was not considered in the best interest of NAT. The decision was well received. The Back-stop facility with its associated terms, has been cancelled. The costs associated with the establishment of the Back-stop facility, paid last year, has consequently been expensed in full this quarter (no cash-effect). Important uncertainty has been removed with the strong tanker market. As in the past, it is an objective to keep debt low. We wish to come back to the financial position about 10 years ago when NAT did not have any net debt. For 3Q2018 a cash dividend of $0.01 per share has been declared. NAT has a policy to maximize dividend payments. Payment of the dividend is expected to be on or about December 7, 2018, to shareholders of record on November 21, 2018. The world Suezmax fleet (excluding shuttle, product and Jones Act tankers) counts 497 vessels at the end of 3Q2018. For the remainder of 2018 we expect 11 vessels, and in 2019 and 2020 we see 20 and 7 vessels for delivery, respectively. 20 vessels have been disposed during 2018, compared to 17 vessels in 2017. Our dividend policy should continue to enable us to pay a higher dividend in a strong tanker market that we see now. Our fleet of 25 more or less identical vessels is a special feature of NAT that is particularly valuable to our customers.